My family loves Fried Rice. I made them the impostor above. 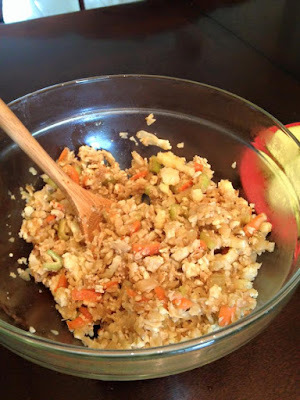 I hope you agree the dish looks amazingly just like fried rice. Pampered Chef has a new product, the Veggie Strip Maker, that easily strips cauliflower into those small rice-like pieces. Yes folks, that is fried cauliflower cooked like fried rice. Steve didn't recognize the cauliflower taste until I let him in on my secret. I was blown away by the delicious dish, low carb and almost zero Weight Watcher points! I'm not a "real" chef but I do have extensive experience cooking and I'm really unsure if I would've known it was cauliflower if someone else had cooked it for me. During dinner that night, God began to point out some things to me about this meal. I'd like to share them with you. As you read the bullet points below, consider Matthew 24:4-5 "Take heed that no man deceive you. For many shall come in my name, saying, I am Christ; and shall deceive many." The cauliflower looks impressively like rice but it is not rice. The cauliflower tastes deliciously like rice but it is not rice. The cauliflower has low calories and carbs and will not satisfy hunger like rice. Cauliflower and rice are deceptively the same color. Cauliflower costs more without the same benefits. Matthew 24:24 says "For there shall arise false Christs, and false prophets, and shall shew great signs and wonders; insomuch that, if it were possible, they shall deceive the very elect." After reading this, I hope you never look at cauliflower quite the same way. May the vegetable remind you that all things are not as they appear. Be careful with your choices. You can always spit out cauliflower and eat some rice. What you don't want is to get spit out by God. Ketchup looks impressively like blood but it is not!